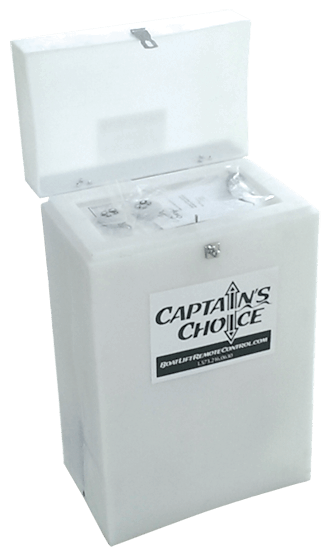 The Captain’s Choice remote system is designed to be simple, fast and reliable. We do this by only using high quality waterproof components. The frame is designed to be universal to all size controls. This gives the customer the possibility of upgrading to a larger lift at any time. All units come with two stage high performance blower motors, and use all full flow valves, to ensure there is no restriction of airflow in the unit. This unit is equipped with waterproof 110V valve drivers mounted in front of our one-of-a-kind bi-directional swing check valve. These valves are designed with a full 1" port on both the raise and lower function to get you the best up and down time out of your lift. The control unit is also equipped with a GFCI power cord to protect your control unit from any electrical fluctuations your dock may have. All units are designed to have one control board to keep the system uncomplicated. All of our remote control systems are equipped with a waterproof extended range antenna that has an average range of 500 feet. This antenna is mounted high on your dock to promote the best range possible. Above the antenna is a strobe light that activates on both the raise and lower functions. Units come equipped with two waterproof key fobs, and there is a simple program button on the control board that makes programming a new key fob quick and easy. 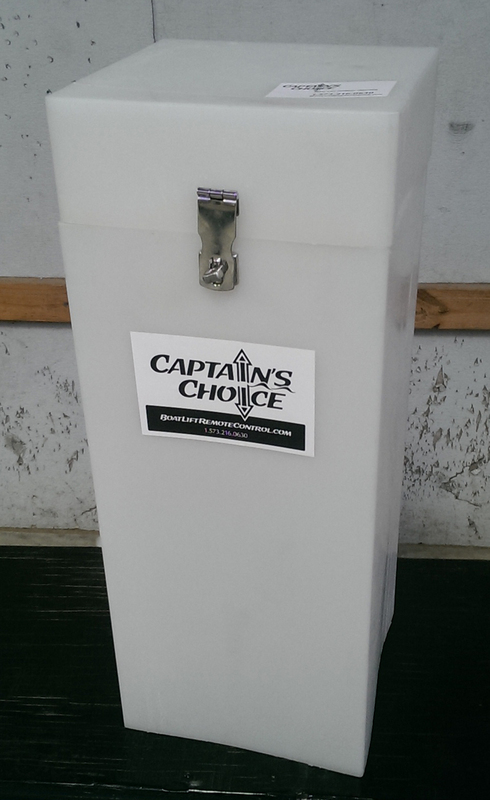 All Captain”s Choice remotes come with a 2-year limited warranty. The DVDB, 3VDB and 4V4B are wired with two GFCI power cords. They require two separate outlets with a minimum 15-amp breaker on each outlet. With most new sales, we are able to give a trade-in for your current manual control unit. 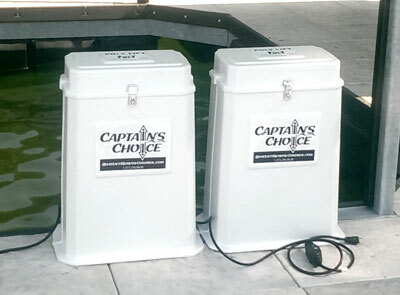 Captain’s Choice offers a multi-unit discount for the purchase of two or more control units. 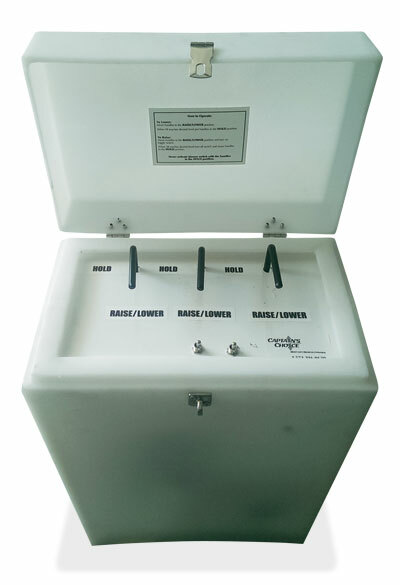 All remote systems are also available in a manual control unit model. 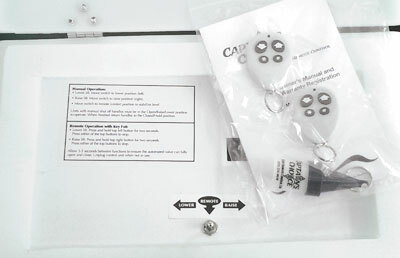 The Captain’s Choice manual control unit is designed to be extremely easy-to-use. It is equipped with a two-position handle and a toggle switch. To lower the lift, simply move the handle to the Raise/Lower position. To raise the lift, handle is kept in the Raise/Lower position and the toggle switch is switched on. To stabilize the lift, simply put the handle back to the hold position. Manual controls can be sold individually or in bulk with a multi-unit discount. Captain’s Choice has an option to wire your control unit into your dock lighting system, so you can operate your lights from your key fob. 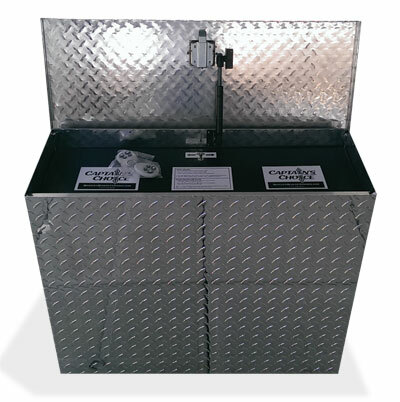 We carry a large inventory of used and refurbished manual control units for all size lifts. All styles of remote controls are available for a retrofit on your existing unit, if applicable. This is a good way to save some money on the remote system if your control unit is still in good working condition. We offer a valve upgrade to existing Aquamatic customers. We can replace your current plunger valve and valve driver with a full port ball valve and new Captain’s Choice valve driver. This will lead to higher performance in down time and (depending on your systems configuration) can also help speed up your raise time. Service all remotes on the lake and carry a full inventory of Captain’s Choice, Aquamatic and Firstmate parts. We have many used parts available to decrease the cost when applicable. Our service call rate is $75.00, plus the cost of parts.